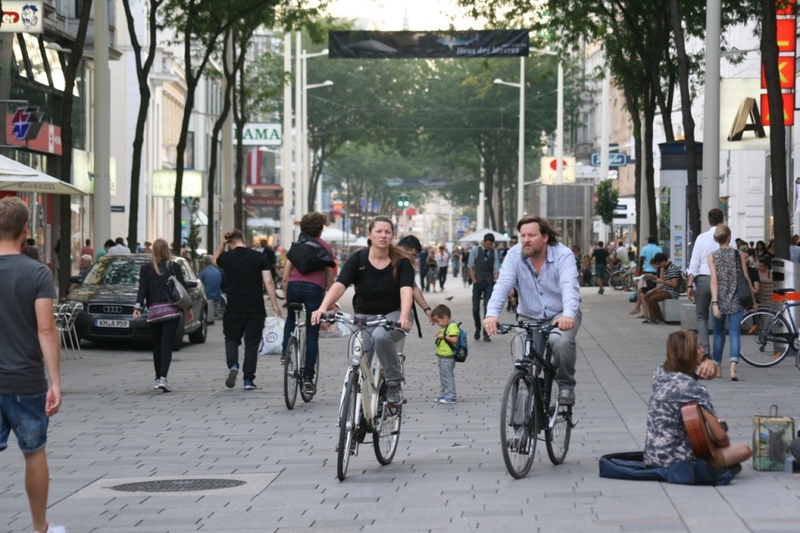 As one of the fastest-growing cities in Europe the City of Vienna faces a major challenge to redistribute road space from cars to people to create better, greener and healthier public spaces, in particular in its dense inner districts. 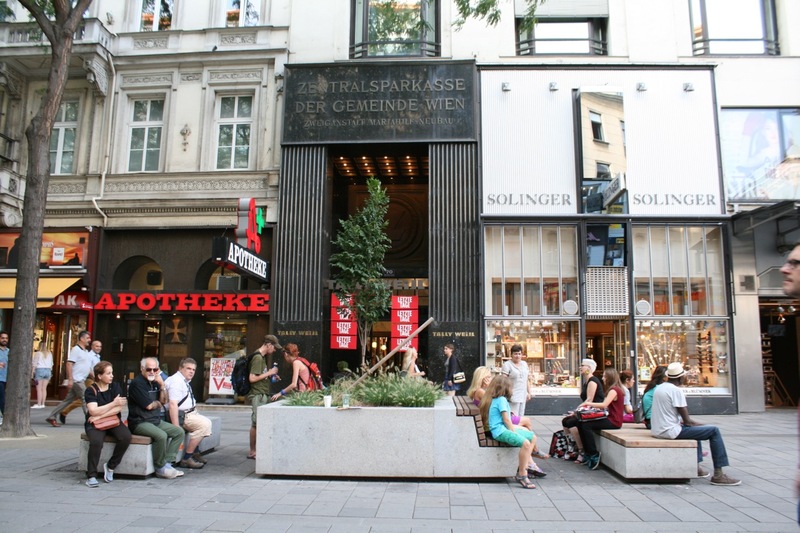 In this sense, the transformation of Mariahilferstrasse, one of Austria’s most prominent shopping streets, from a regular road to a street for people with a pedestrian zone and two shared space areas has become a landmark project for Vienna’s future urban development. 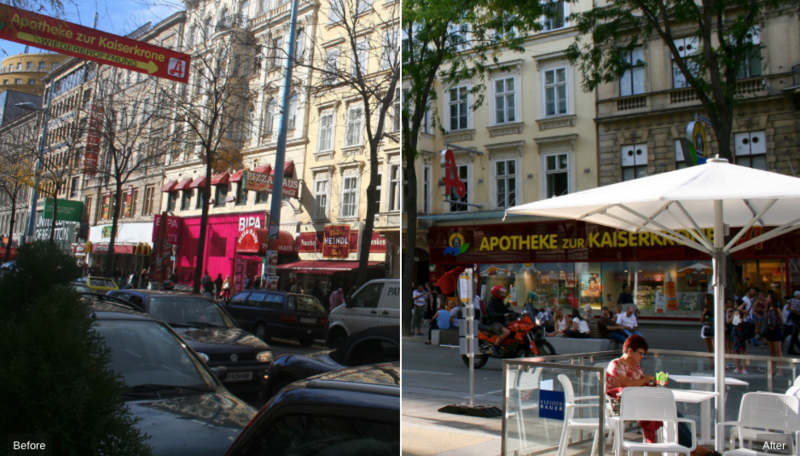 This transformation is about fairness: With pedestrian volumes significantly increasing for the past 20 years, around 60,000 pedestrians vs. 10,000 cars used Mariahilferstrasse on a regular day before its transformation while its design showed a clear priority for the car. 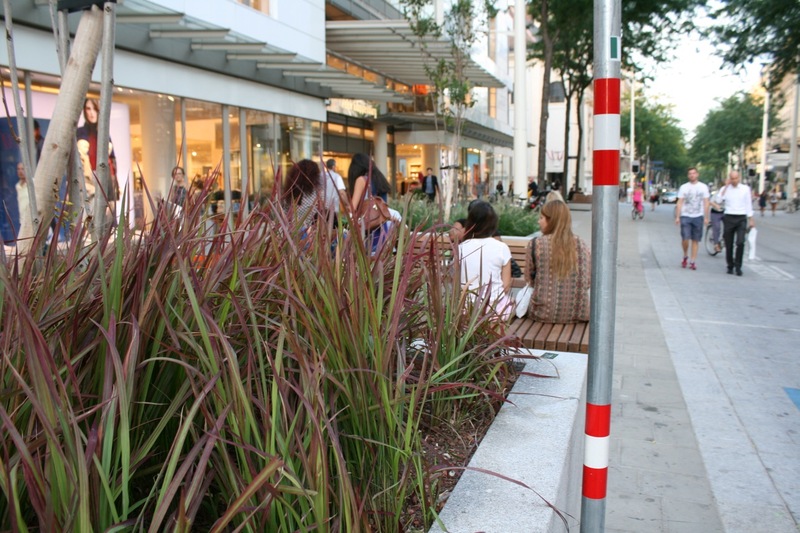 Today, pedestrians come first and have plenty of opportunities to stroll and to sit down and enjoy this public space. Moreover, pedestrian safety increased as cars move slower and have to communicate with pedestrians and cyclists. 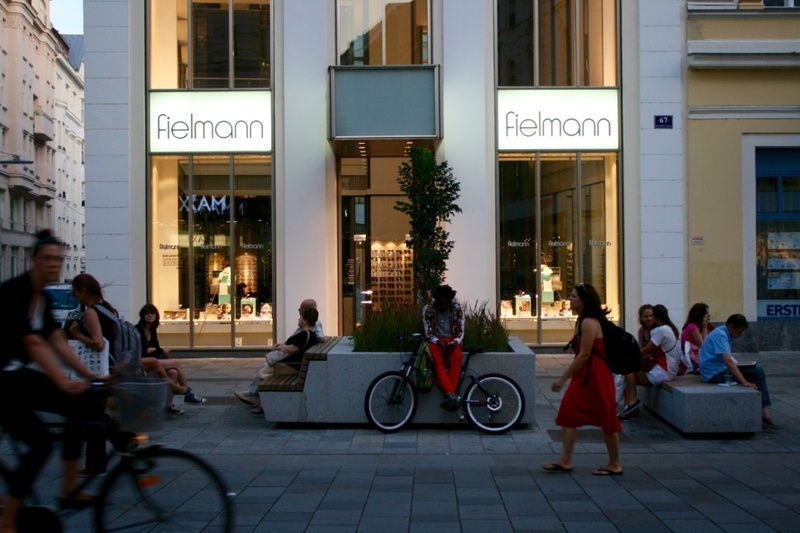 As people stay longer, this also brings economic benefits which are reflected in many new businesses (in particular large, renowned retail chains) opening stores on Mariahilferstrasse. A walk along the 1.6 km long Mariahilferstrasse from Vienna Westbahnhof train station to Museumsquartier cultural quarter shows us how the street was transformed and how its new design and different elements create a more vibrant space and contribute to its popularity (according to a recent survey, two thirds of people who have visited the street after its transformation are either very satisfied or rather satisfied with the result). It should also be noted that construction was completed both on time (two construction periods each lasting for around 6 months) and within budget (EUR 25m). 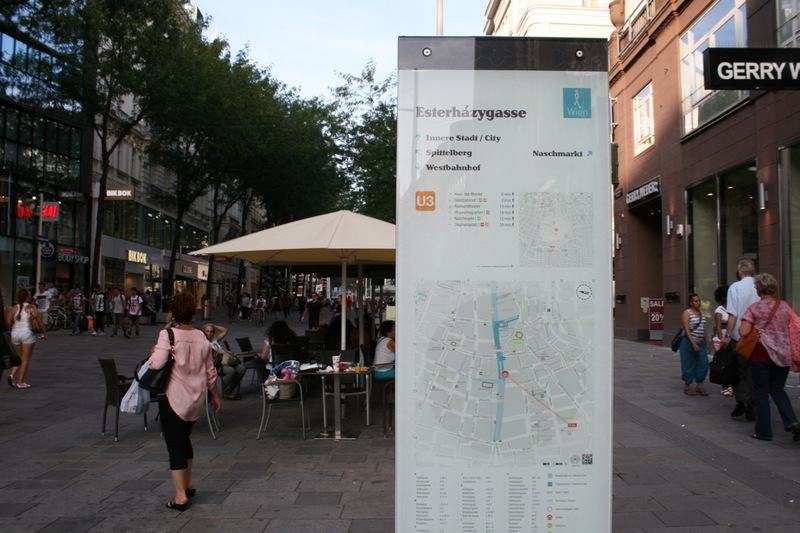 Entering the first, 459 meter long shared space “Begegnungszone” between Kaiserstrasse and Andreasgasse. 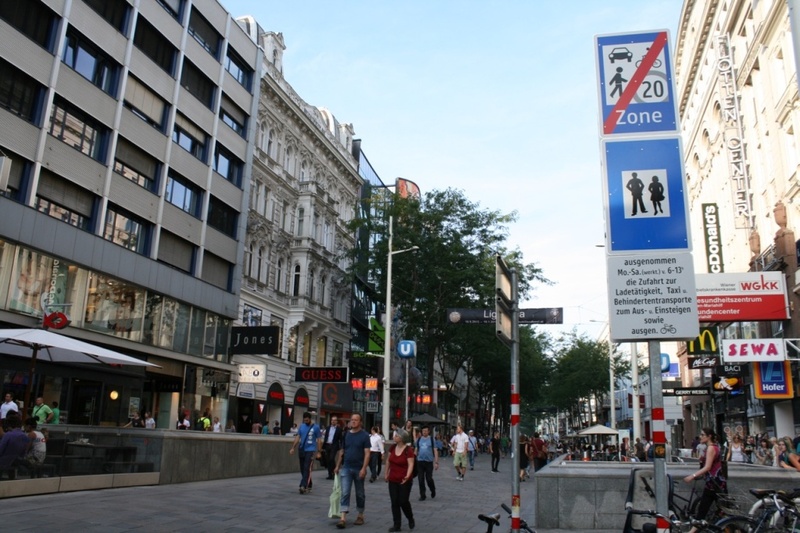 Shared spaces were introduced in Austrian traffic regulations in March 2014, give pedestrian priority and allow cars to drive at a maximum speed of 20 km/h. 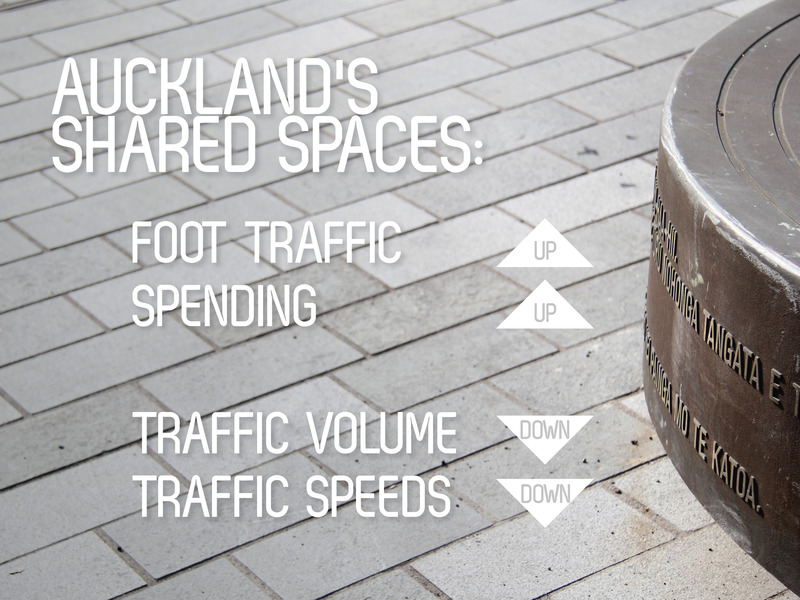 The shared space includes delivery zones with designated delivery times which makes logistics easier for many of the shops. Water plays an important role in the diversity and attractiveness of public spaces. 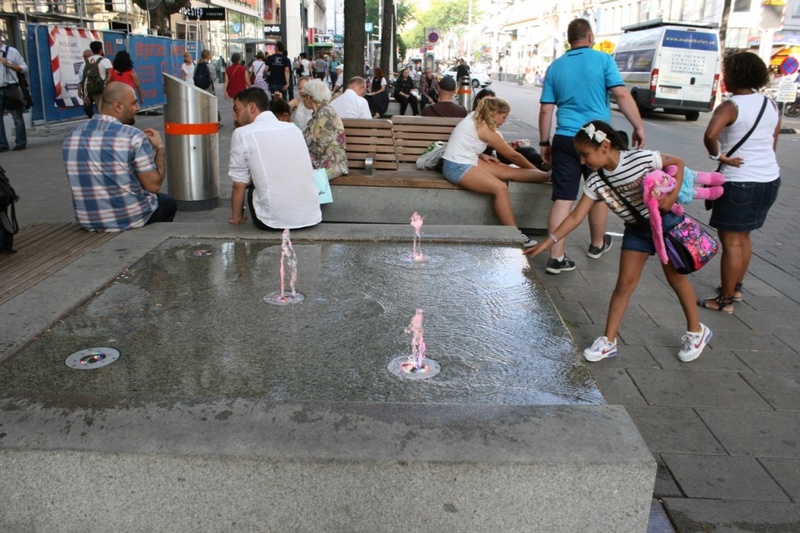 Four of these water tables which light up in the evening attract both children and adults. Two crossings for cars were introduced to allow cars to move directly between the 6th and 7th district. The different road surfaces and levels extend the shared space into the side streets and force cars to slow down when entering the shared space. More than 3 km of orientation system for blind people and 5 designated crossings allow visually impaired people to move safely in the shared space. 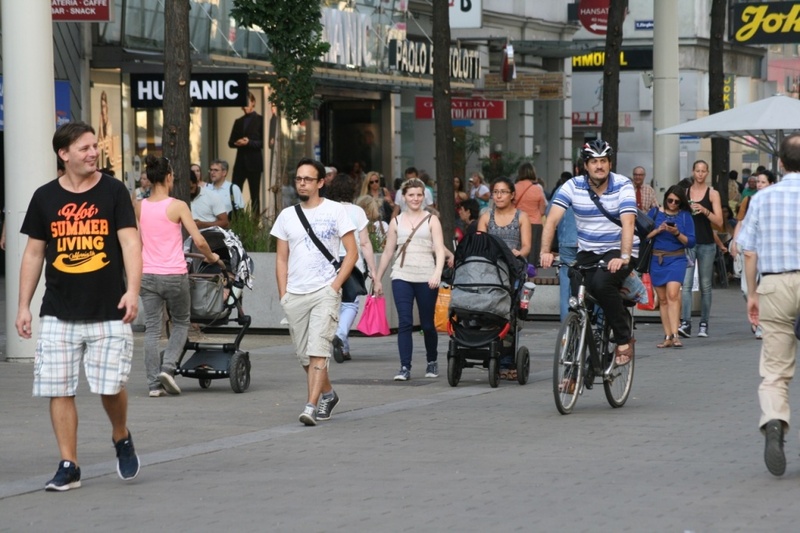 Getting more space makes it much easier for people with baby strollers to walk along Mariahilferstrasse, in particular compared to the crowded sidewalks of the past. 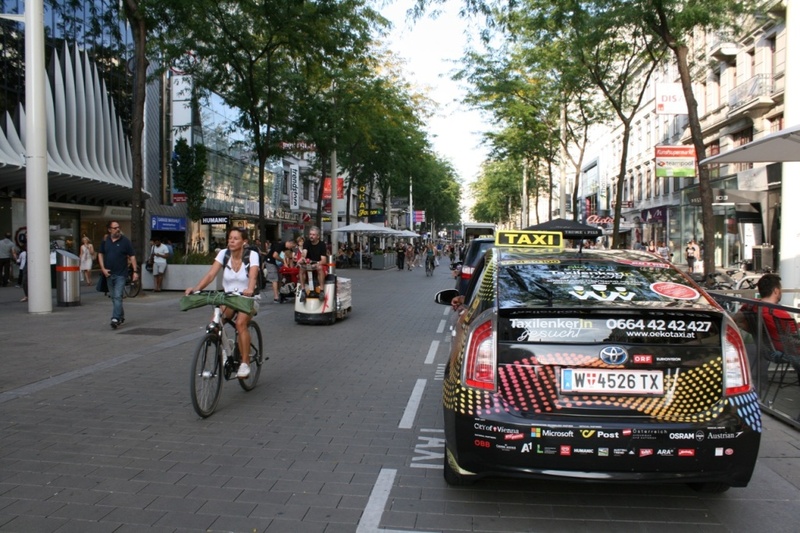 The shared space also includes designated parking spaces for taxis and people with special needs. 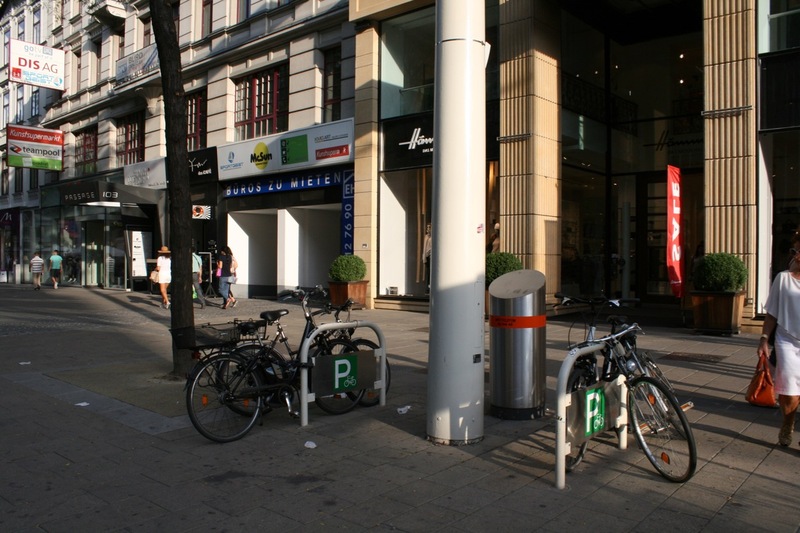 Several bike racks are placed along the whole street. 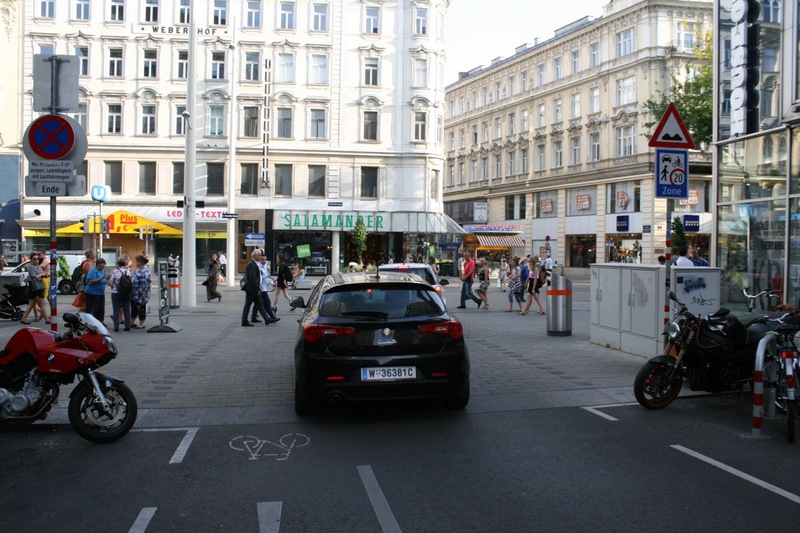 Biking is allowed both in the shared space and in the pedestrian area. 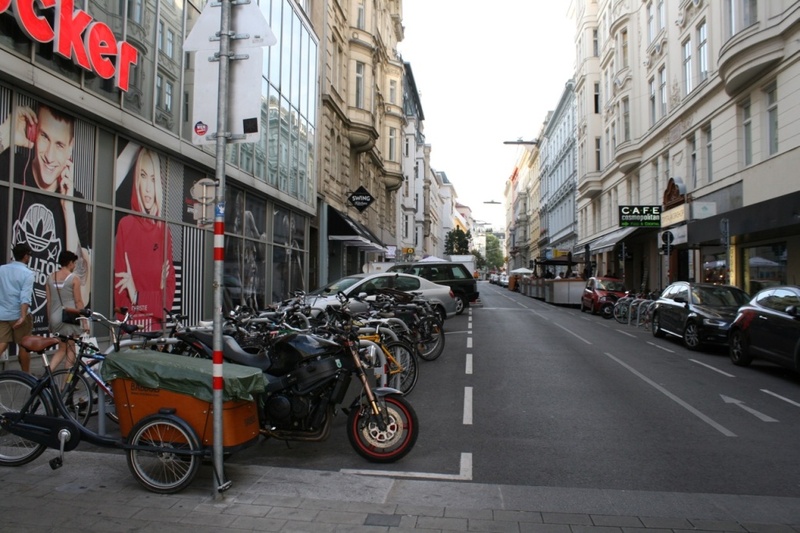 Significantly more bike racks are placed around the corner in Mariahilferstrasse’s side streets. 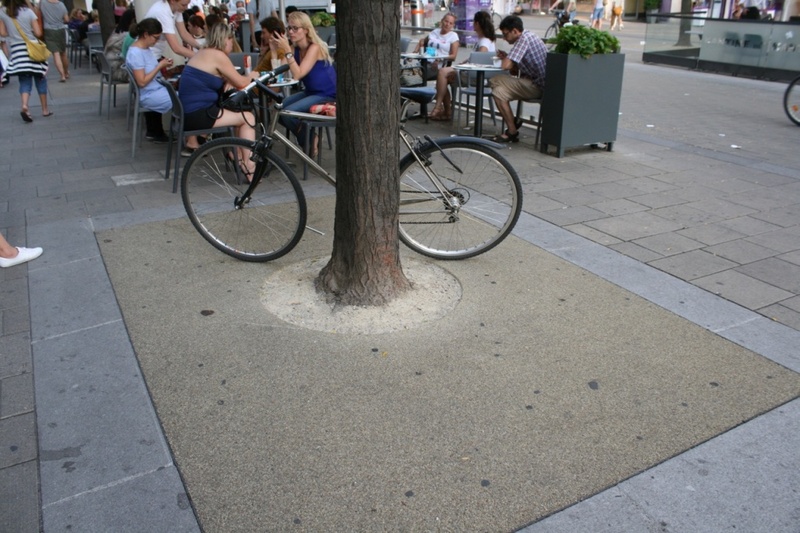 Tree pits are covered with a special surface that lets water and air through while being barrier-free. Entering the 432 meter long pedestrian area which allows cyclists to move at walking speed. 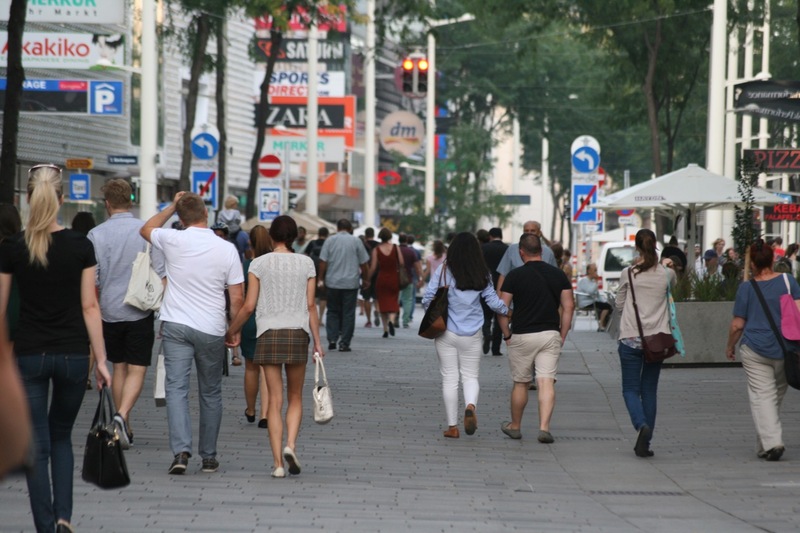 The new pedestrian wayfinding system shows distances to public transit stations, carsharing and bikeshare locations, public restrooms and other places and amenities to encourage people to walk to nearby places. Moreover, they are an integral part of the city-wide higher-order walking routes that will be introduced in the coming years. 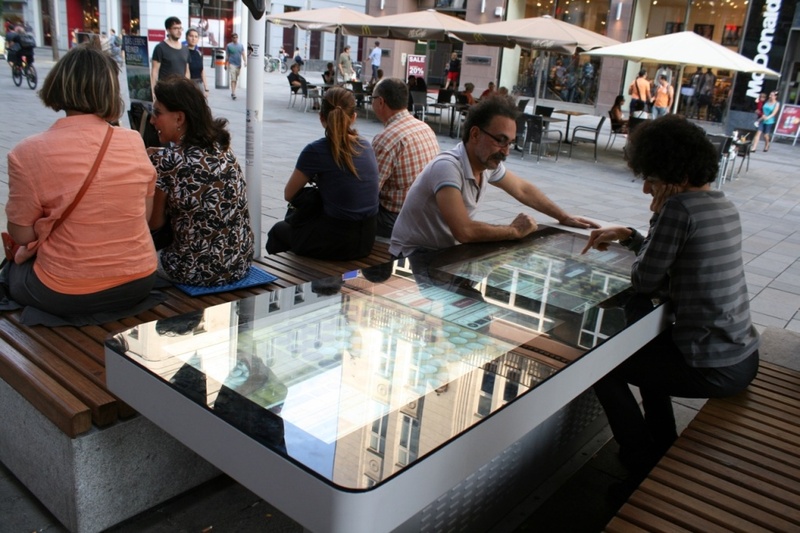 The street’s diverse places and attractions also include this table with its giant touchscreens where people can play the Asian game “Go”. People now use the whole space. 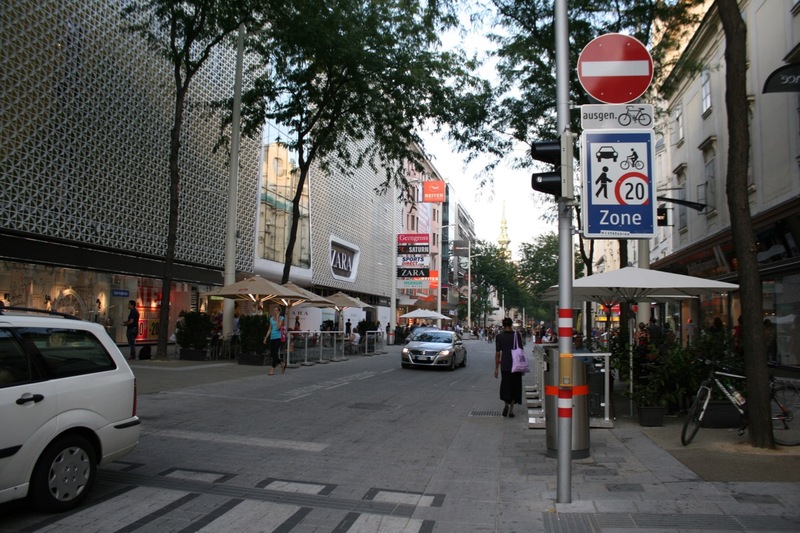 Despite being allowed to cycle in the pedestrian area, many cyclists use parallel streets like Lindengasse as these allow for higher speeds. 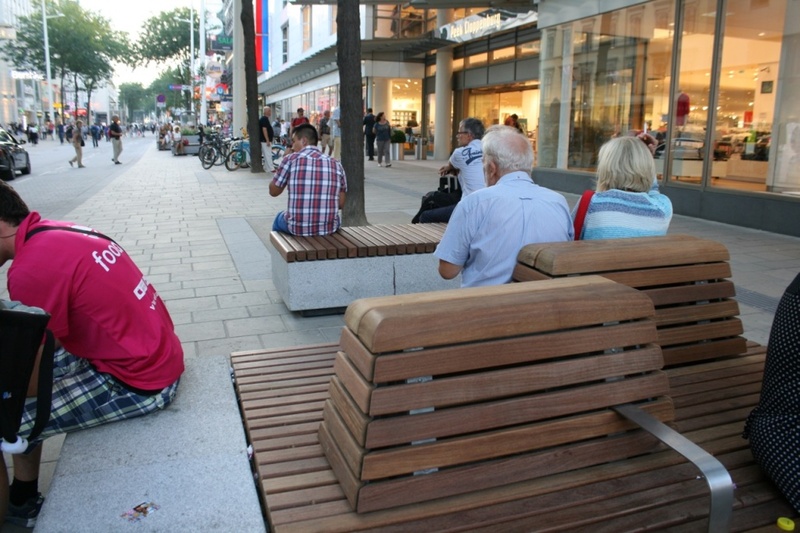 82 new street furniture pieces give people plenty of different opportunities to sit down and have conversations without having to consume something. 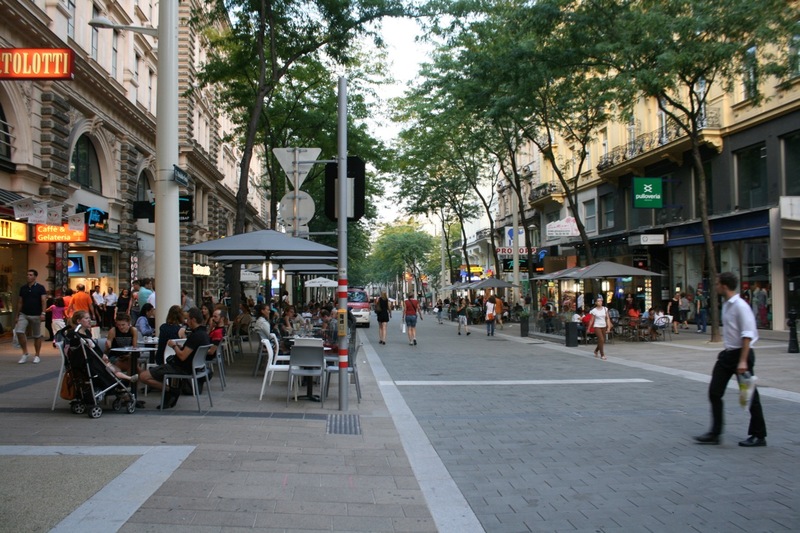 The street’s transformation quickly led to an increase in patios which were also moved further inwards to increase the space in front of shops. 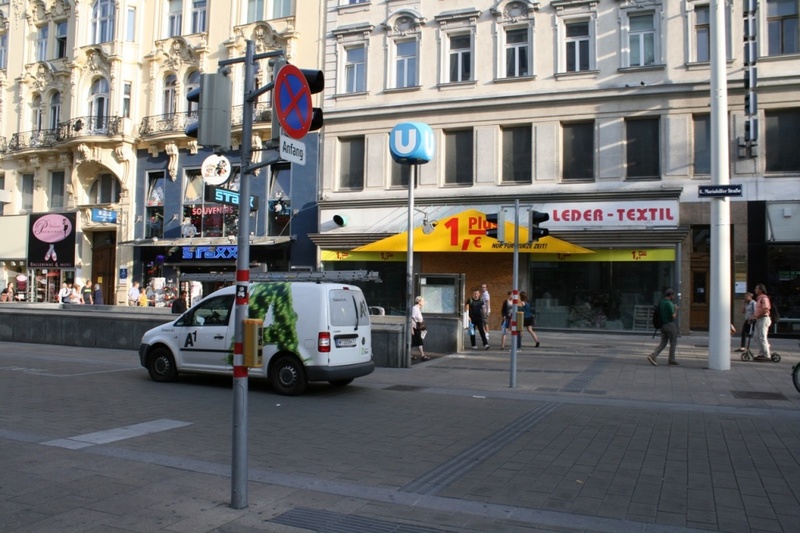 The pedestrian area also features Vienna’s most useless traffic light which is of course ignored by most pedestrians. 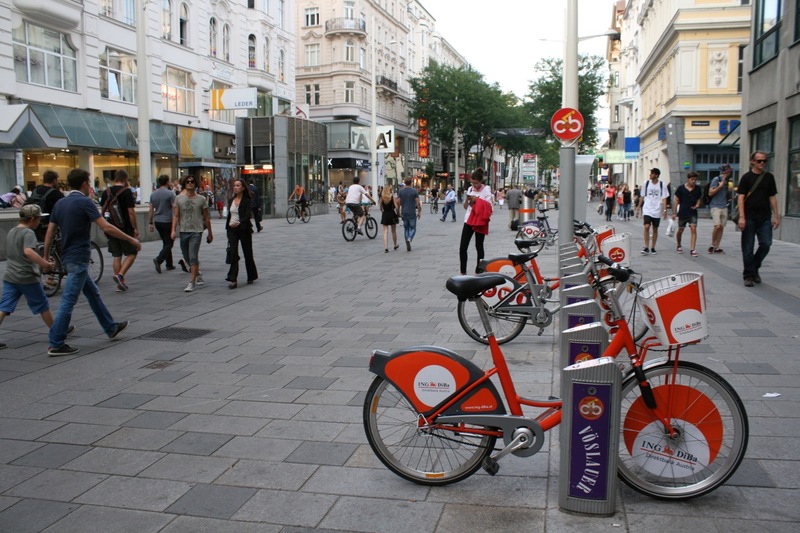 Two Citybike Wien bikeshare stations encourage people to get to Mariahilferstrasse by bike. 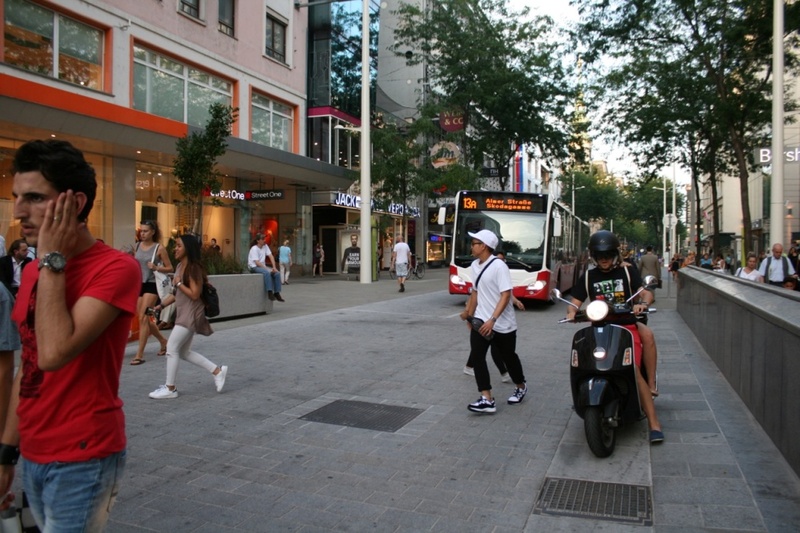 As expected, pedestrians love the new pedestrian area which makes Mariahilferstrasse a more enjoyable shopping street. 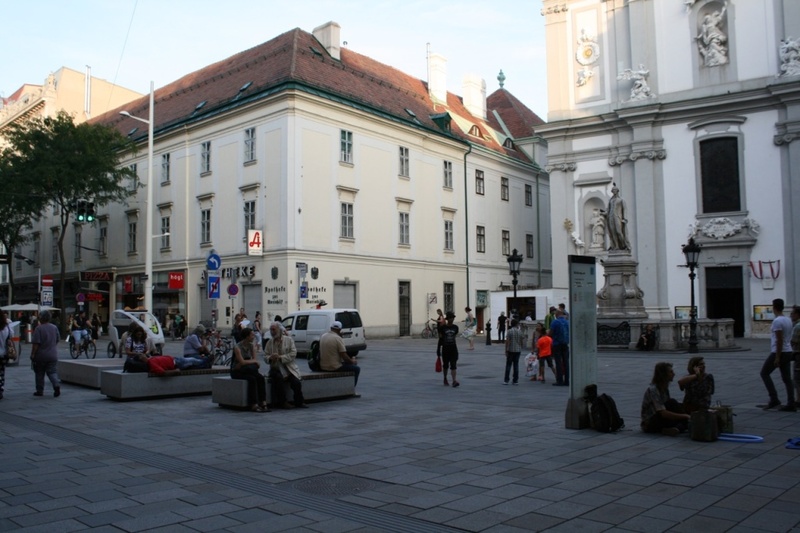 The area in front of the Church of Mariahilf has become a great place. The redesigned street allows unlimited different uses such as playing the guitar in the middle of the street. In particular, it also gives children the opportunity to move freely and safely explore the world around them. 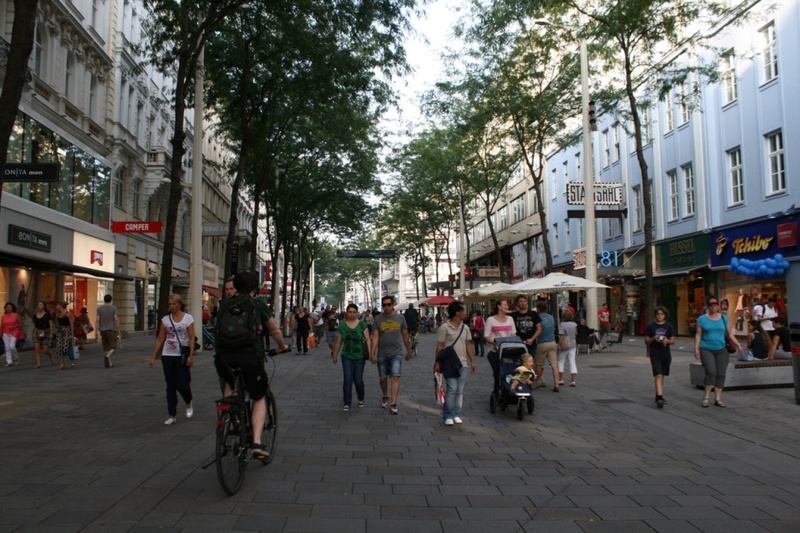 Entering the second, 739 meter long shared space between Kirchengasse and Getreidemarkt. BTW: The street lamps got 111 new lamps, a new bright paint and integrated WiFi. 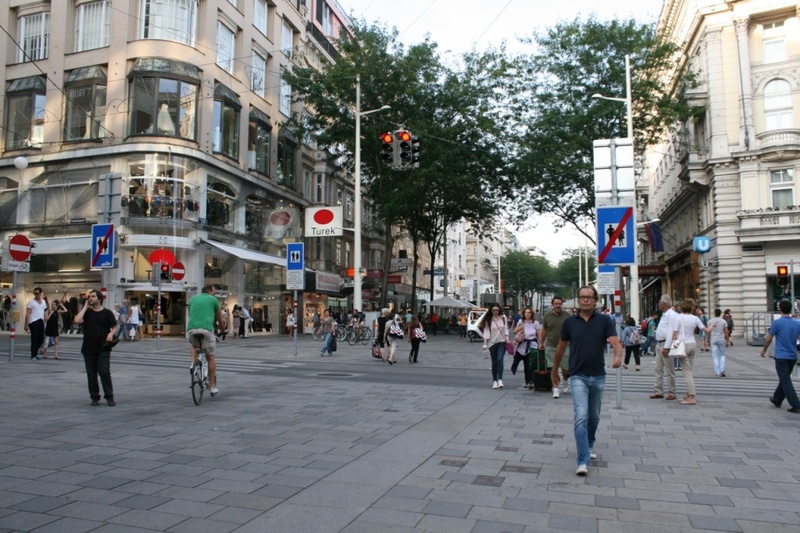 Moreover, the lights from shop windows and from street lamps are aligned and energy use decreased by 80%. This shared space is also used by the 13A bus line. 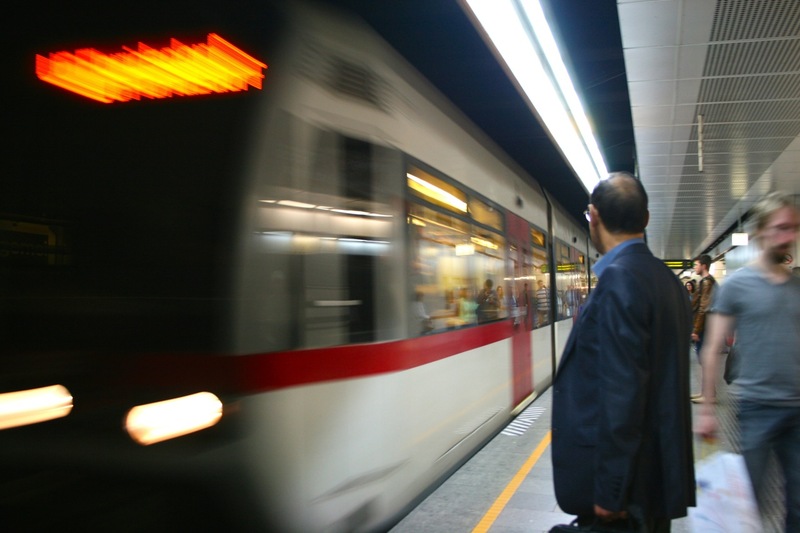 However, there are still controversies on how to best integrate the bus into the street. Thanks to 12 WiFi transmitting stations and 400 new access points, free WiFi is provided along the whole street. Different plants as well as trees on both sides of the street make it a green space. More opportunities to sit were the biggest request from citizens during the comprehensive and diverse public engagement process. 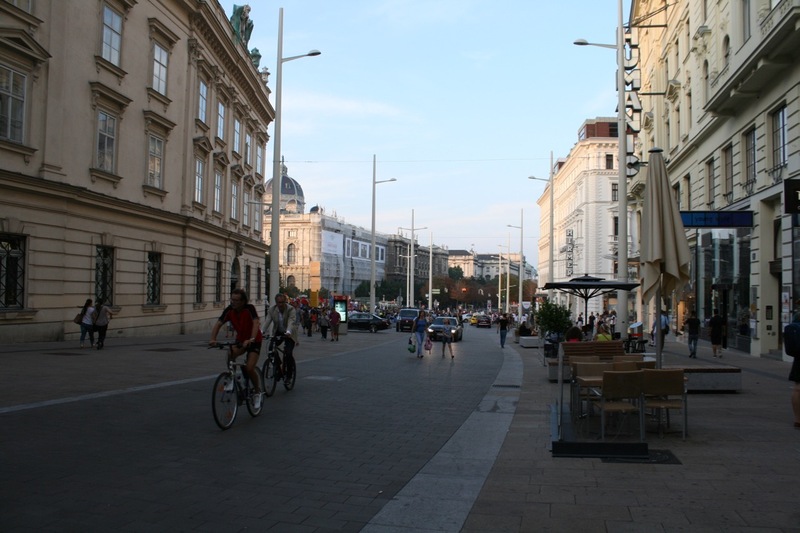 However, the way the street furniture was arranged still enables pedestrians and other road users to move quickly through the street. 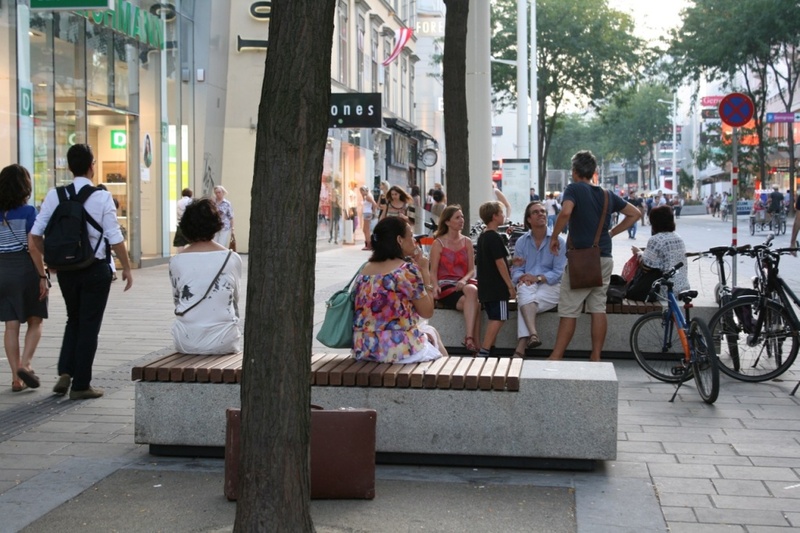 Different types of street furniture allow for different uses while combining them in small “seating islands” encourages conversations and interactions. 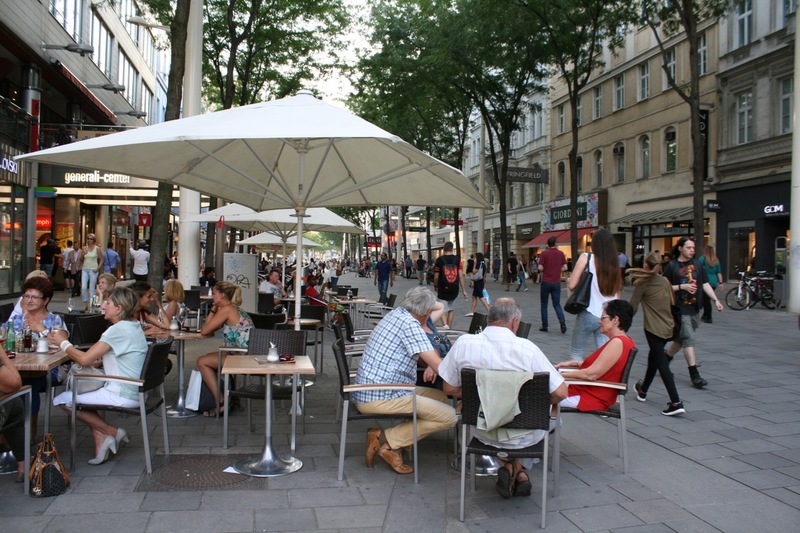 There’s a healthy mix of both commercial and non-commercial outdoor seating opportunities. 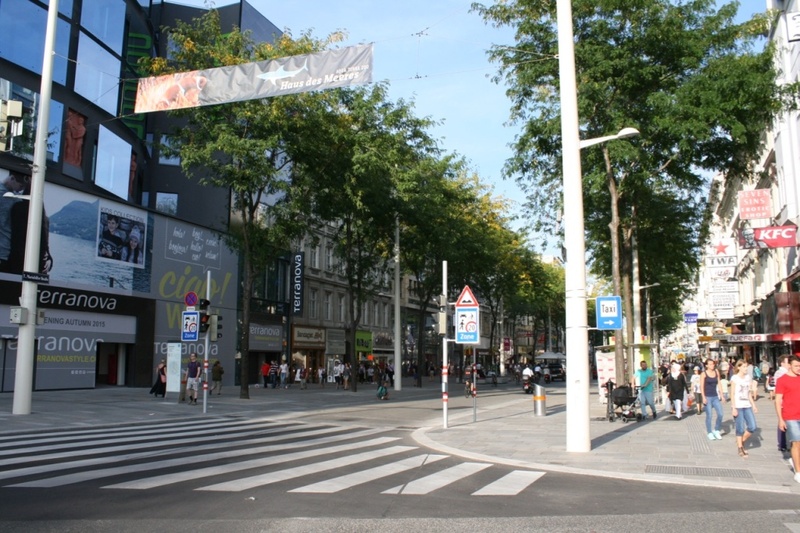 This picture also highlights the importance of the trees which were also part of the former Mariahilferstrasse. Finally, we arrive at Museumsquartier cultural quarter which is another important public space in the neighbourhood. 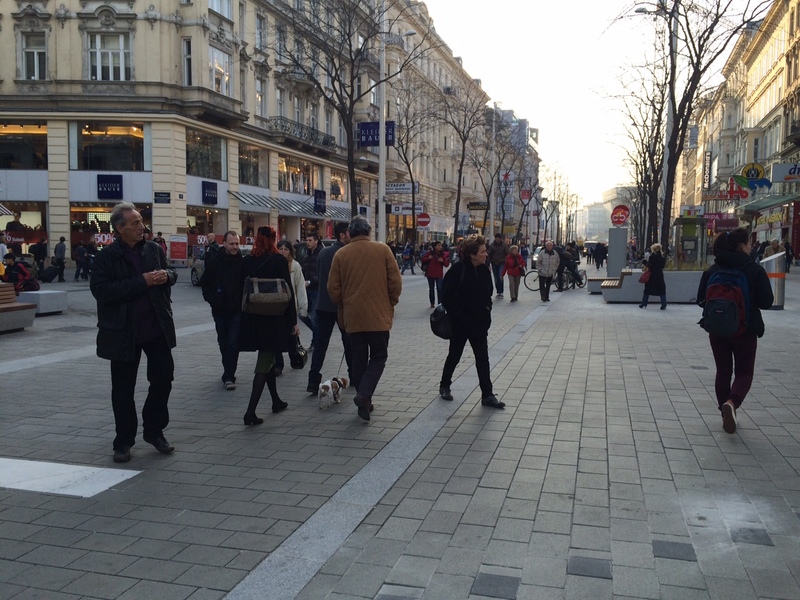 In all, the transformation puts people first and adjust the street to the human scale. 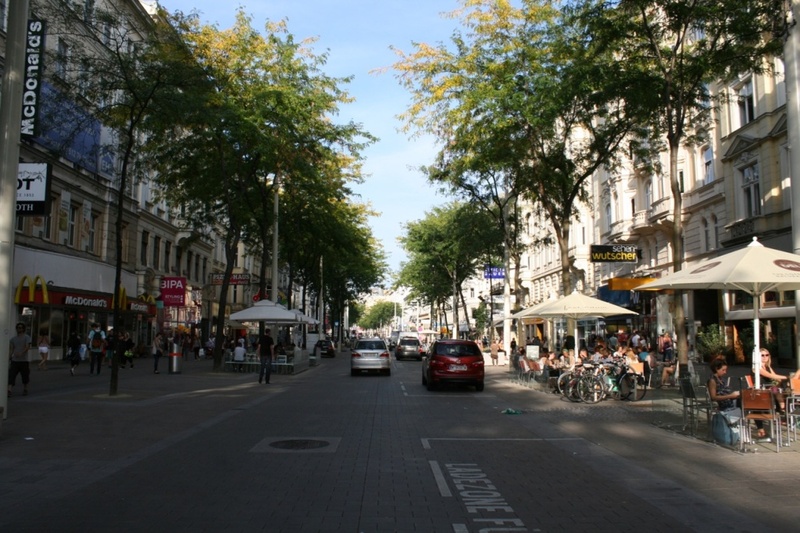 It not only decreased car traffic on Mariahilferstrasse itself but in the whole neighbourhood.